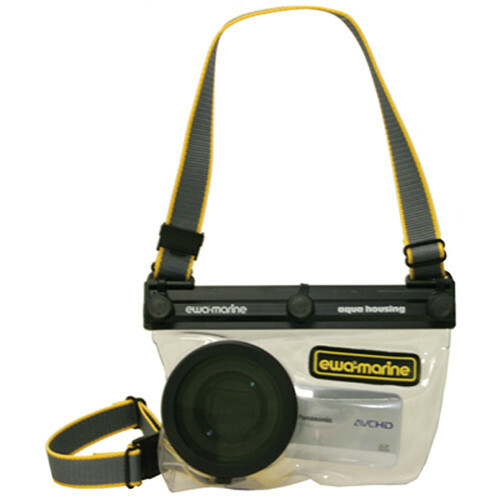 The VLB Underwater Housing for Camcorders without Eye-Piece Viewfinders from Ewa-Marine is a waterproof case for camcorders that do not feature eye-piece viewfinders. The housing has a depth rating of 32.8' (10 m). Constructed from durable, double-laminated PVC, the case has an integrated, optically neutral flat glass port. Perfect for snorkeling or shallow diving and capable of optimal operation in sandy, dusty, humid or foul weather conditions, this housing will provide your camera with the best possible protection, while allowing full access to all camera functions. A pair of corrosion- and seawater-resistant clamping rails fit together to give the housing a watertight seal. The rails tighten via knurled thumb screw knobs. The included CA Adapter System allows you to attach 52mm threaded lenses or filters, such as color correction filters, to the front of the housing's port. Step-up rings are included to bring 43 and 37mm threads up to the 52mm size. The VLB is supplied in a handy yellow carrying case with a water-proof interior and zippered side pocket. Box Dimensions (LxWxH) 12.4 x 12.3 x 4.6"